– It’s a direct line to your subscribers and customers. There are many benefits to preloading your autoresponder with messages. If you’ve ever had trouble keeping up with publishing a newsletter, this could be a breath of fresh air. When you preload your autoresponder, each subscriber gets every email, in the order and interval you specify, making it easier to stay in touch with your subscribers. Build Relationships with Your Visitors Easily– The autoresponder works for you 24 hours a day, 7 days a week to ensure that you are reaching out at the times your subscribers are likely online. In an autoresponder, all emails are prewritten, so you don’t have to work so hard to reach everyone. A Great Way to Remind Interested Parties of Your Best Content– Don’t expect your readers to be able to find all your best content or know about everything you have to offer. They find your blog and think it’s full of great information which is why they decided to sign up for your email list. Send them reminders via the autoresponder to help them find some of your best posts, products and other content all over again. An Easy Way to Survey Your Potential Clients– You can use your email list to find out what types of products and services your target audience needs by conducting an email poll through your autoresponder. If every person who subscribes gets the survey. Over time, you can get a lot of valuable information to help you with your marketing on an ongoing basis. Easy to Follow Up with Website Visitors– Immediately follow up with every visitor who signs up automatically. The same goes for every customer and they should get added automatically to a mailing list. Your autoresponder will never forget anyone because it’s all automatically done once you set it up. Easy Way to Duplicate Your Efforts– No need to clone yourself, you can market continuously by loading a pre-sequenced list of emails into the autoresponder to work for you 24/7. You don’t have to keep coming up with topics if the work is already done. You’ll Generate More Sales– By relationship building and following up in a timely manner, you’ll naturally generate more sales and create repeat customers. People like buying from those they know, like and trust and nothing can help you accomplish that quite like a well-designed autoresponder email sequence. Fabulous Way to Obtain Measurable Information– You know that you need to study metrics to know what is working and what is not working. 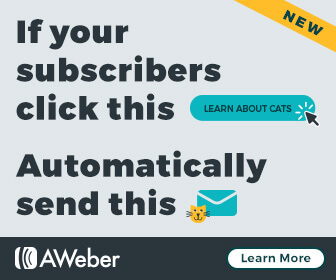 Using an autoresponder automatically provides a way to let you know a lot of information about your subscribers and even whether or not they are opening or clicking through to see the information you’ve suggested. Over time, you can gather a lot of data as more and more people receive the same messages. Whether you only use pre-sequenced autoresponder messages or if you send newsletter broadcasts…or if you do a combination of both, email has tremendous potentially increase your visibility, improving your traffic and increasing your sales.